Located on the seafront of Marebello di Rimini, right in front of the beach, the Beverly Hotel is a three-star hotel characterized by a beautiful swimming pool with sunbathing area, garden, parking and free WI-FI. Admits animals of small and medium size. The hotel is located on the seafront, a few steps from the beach, in the Marebello area, south of Rimini full of bars, restaurants, pubs and shops. The rooms have a balcony (also with sea view), air conditioning, WI-FI, digital terrestrial TV, safe, telephone, bathroom with shower and hairdryer. Hotel Beverly features a swimming pool and a sunbathing area with sun loungers and parasols, a garden, a terrace, a lift, a TV room, a reading room, a bar, a restaurant and a breakfast room. The property is equipped for cyclists and offers free use of bicycles. PARKING: uncovered, limited places; 1 km from the hotel with 24-hour shuttle service to all. CONVENTIONS: beach, amusement parks, discos, spas, organized excursions. LUNCH AND DINNER: three menus with traditional dishes based on meat and fish, vegetable buffet. Pasta and desserts are homemade, water included with meals. VARIATIONS: vegetarian cuisine, vegan and celiac (both on request). In hotel: strollers, baby / mini club, live entertainment, baby sitter and pediatrician (both on request). At meals: baby menu, baby food, kitchen for mothers, seats at the table. At the beach: live entertainment, baby club, nursery. In the outdoor area there is a large pool of 110 square meters. Ideal for adults and children, it is composed of different depths ranging from 1 to 3 meters. The swimming pool has a trampoline and a solarium area. 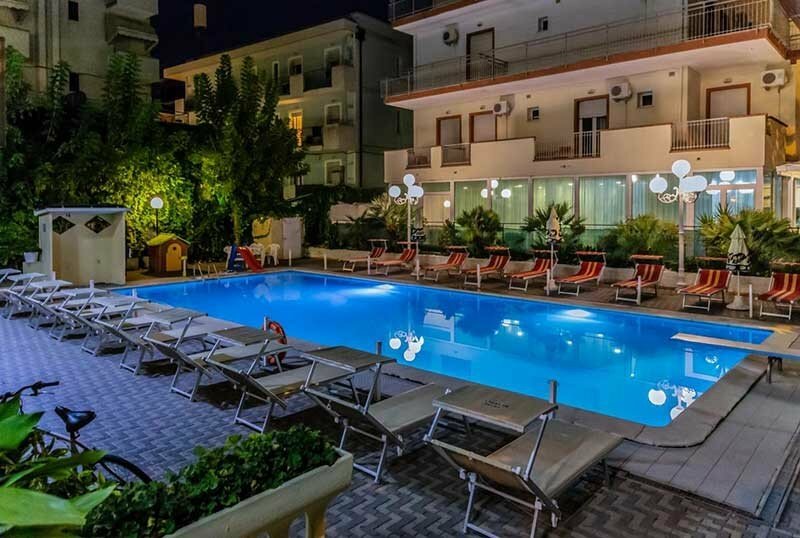 The hotel has an agreement with Bagno 98 Acquamarina where they are located in addition to sunbeds, beach umbrella and cabins, sports fields, inflatable games, baby club and nursery, equipment for lunches, dinners and barbecue, entertainment and tournaments. Parasols areas are available where you can bring small and medium-sized dogs. The above prices are intended per person per day and for stays longer than 3 days, they also vary depending on the period of the requested month and the residual availability. TOURIST TAX: excluded. City of Rimini tourist tax of € 1.50 per day for a maximum of 7 days. To guarantee your booking and to block the offer we have reserved, we request a small deposit, you will receive by e-mail the methods of sending and our details once the booking is confirmed. "... and if I can not come anymore, I lose the deposit?" - if you give up your stay 30 days in advance, you will recover the entire deposit paid. - if the cancellation of the stay arrives 15 days in advance, 50% of the deposit will be retained. - if the cancellation is made less than 15 days before the arrival date, the full amount of the deposit will be retained. - It is possible to use the amount recovered in another stay during the current summer season, even by a friend / acquaintance. Take advantage of our offers for weekly stays for the months of May and June. Prices starting from € 39.00 per person in All Inclusive with beer wine and drinks included with meals and Beach Service (umbrella and sun beds) included in the price. up to 9 June the first child up to 6 years is FREE, the second child up to 12 years has a 50% discount.